M-Grain Essential Oil a fantastic blend that will help with stress particularly in the head and neck areas when applied topically. Wonderful when working on the computer. Place two drops in the palms of the hands, cup over nose, and breathe deeply. Apply on temples, forehead, and back of neck. This is an easy reference guide for M-Grain Oil Blend. It will tell you how to use your oil blend and what to use it for. It will also provide you with some fun tips and testimonials! Want to Purchase Therapeutic M-Grain Essential Oil? Go to the Oil Shop! Buy M-Grain Oil Here! What is in M-Grain Essential Oil? There are six therapeutic grade essential oils in M-Grain. They are listed below along with a brief description of each oil. Marjoram Essential Oil (Origanum majorana) It is beneficial for occasional simple nervous tension. It is also a key oil in the Raindrop Technique. Lavender Essential Oil (Lavandula angustifolia) can help you relax, wind down before bed and even ease stress. Its balancing properties create a environment of relaxation especially when diffused. Helichyrsum Essential Oil (Helichrysum italicum) known for its restorative properties and provides excellent support to the skin, liver, and nervous system*. 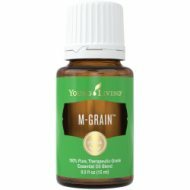 What are the Documented Uses for M-Grain Essential Oil? Ease stress in head and neck. Massage on muscles after exercise to soothe discomfort. What is the Aromatic Affect on the Mind? Invigorating and cooling. What is the Spiritual Influence? This oil will clear negative emotions of anger or irritation. It will help you let go of negativity from the past and embrace from your current experiences. What are the Safety Precautions? Dilution recommended for both topical and internal use. Dilute before using on sensitive areas such as the face, neck, genital area, etc. Keep away from eyes. This is an EarthKosher Certified essential oil! Place on neck when doing computer work.